First post-contrast Acquisition SubTracted (FAST) protocol, an abbreviated breast MRI scan, takes a fraction of the time to perform and requires less time for a radiologist to interpret than a screening exam using a full diagnostic breast MRI protocol. For these reasons, it is also less costly and facilitates increased patient throughput. Courtesy of Manish Jain, MIA Victoria. The FAST protocol can confidently be used for breast cancer screening, Australian radiologists advise in an article published in the Journal of Medical Imaging and Radiation Oncology. They reached this conclusion based on the results of a study that showed false positive rates and recall rates were comparable between a FAST MRI screening exam and a full diagnostic breast MRI exam. The standard breast MRI protocol for breast cancer screening studies recommended by the American College of Radiology (ACR) and the European Society for Breast Imaging (ESBI) takes approximately 40 minutes to acquire. At MIA Monash Radiology and Monash Breast Clinic, outpatient imaging centers in Clayton, Victoria, the sequences for a full diagnostic breast MRI include: acquisition of T1 axial, coronal, TIFS axial, and STIR images, followed by five sets of contrast-enhanced dynamic images. These included three contrast-enhanced sequences each taking about 60 seconds to acquire, T1 sagittal dynamic views of the right and left breast, and a MIP reconstruction. The FAST protocol acquires only non-contrast T1, the first dynamic series, and its subtracted image sets. Lead author and radiologist Manish Jain, MD, and co-authors wanted to determine if the FAST protocol would provide adequate diagnostic information to make a diagnosis in confidence, and specifically if the use of FAST scans increased false positive rates and recall rates. They retrospectively evaluated 591 women who had breast MRI exams over a 12 month period. The T1W and the first post-contrast and subtracted images from each of these scans were interpreted by experience breast MRI radiologists who were blinded to the final diagnosis. Scans with abnormalities were correlated with the original reports and patients who were recalled were identified. A total of 552 exams were normal on both evaluations. Five FAST exams detected abnormalities not identified on the original breast MRI report. The FAST exam had a recall rate of 6.6% compared to 5.8% for the conventional breast MRI. FAST interpretations had 28 false positive cases (4.7%) compared to 23 cases (3.9%) for conventional breast MRI. The differences were not statistically significant. “Potentially, 552 women could have been adequately screened using FAST. Thus, 93% could have been told with 99.8% confidence that they did not have breast cancer,” wrote the authors. As long as any recalled patient could have a second mammogram with digital tomosynthesis, breast ultrasound, an additional MRI, and/or image-guided biopsy, the authors felt that a FAST protocol could be confidently substituted without diagnostic compromise. The authors recommend that additional research studies be performed with a large population cohort to validate their findings. Jain M, Jain A, Hyzy MD, et al. FAST MRI breast screening revisited. J Med Imaging Radiat Oncol. Published online July 27, 2016. (DOI: 10.1111/1754-9485.125). 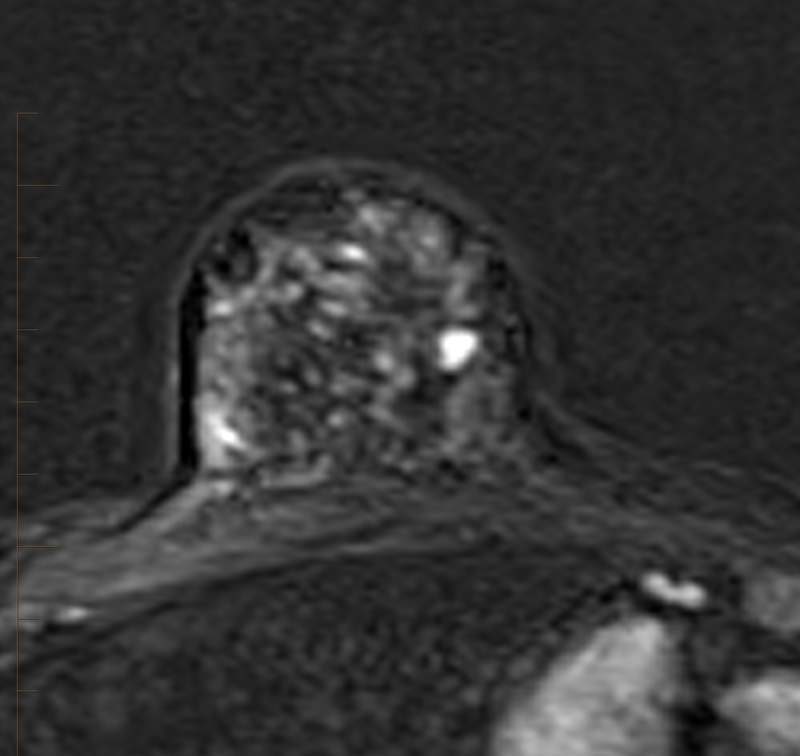 FAST breast MRI can replace conventional breast MRI . Appl Radiol.